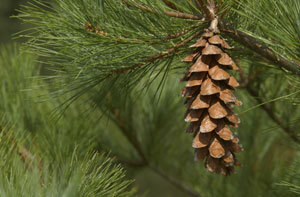 The sticky sap I pry loose from the pine cone near me was chewed, no doubt, by Indian youth. It contains a substance much sweeter than sugar. I savor its surprising intensity, remembering winter sore throats soothed and sore gums strengthened. (Myrrh is a distant relative.) Mixed with grease, the sap is a superb sealant for canoes and water vessels.